Orchids are known for their beautiful, aromatic flowers. They are originally from tropical regions, but can grow in most places with the proper care. Like other plants, you can clone orchids through a method called propagation. Orchids are known for their beautiful flowers. Mix a solution of 1 part bleach to 3 parts water and use it to clean the razor blade or knife you're using to cut the orchid stem and the pots that the new orchids are being planted in. 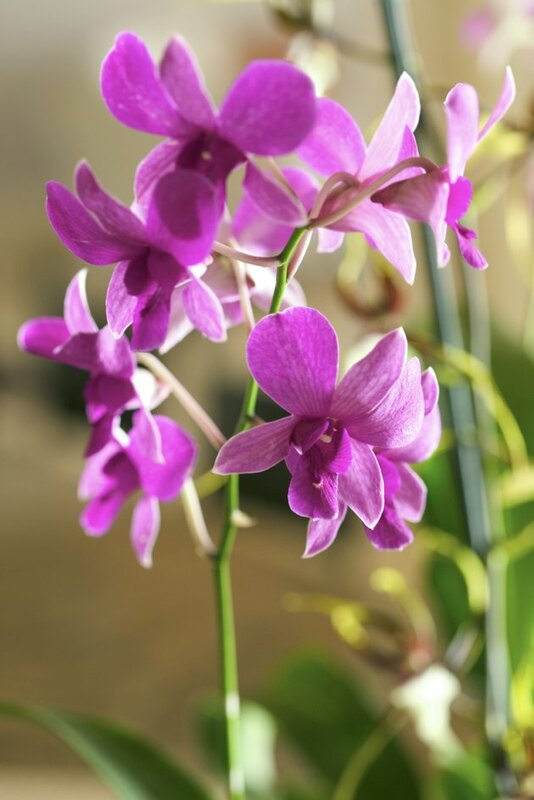 Put on clean gloves or wash your hands to avoid contaminating the orchid. Cut a 12-inch-long stem from the plant, then cut the 12-inch section into smaller parts that are 3 to 4 inches long. When cutting the stem into smaller sections, make sure that each one has at least one dormant bud on it. Lay the cut stems onto damp sphagnum moss. Move the stems and moss to a place that is shaded and humid, leaving them there until small plants begin to emerge from the buds. Place standard orchid compost into the pots, then plant the new orchids into the pots. Apply a 10-10-10 fertilizer to the soil. Place the plants into a humid, well-lit area where they will receive 12 to 14 hours of light every day. Water the orchids once a week.